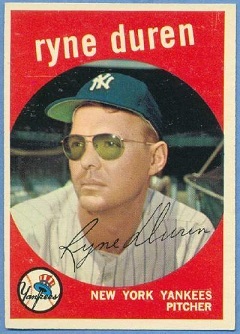 Relief pitcher Ryne Duren, who pitched for eight teams over his 10-season career—but who’s best known for his stint with the Yankees in the late-1950s and early ’60s—passed away Thursday at age 81. He was known for throwing hard, and he was known for seeing poorly. It was a terrific combination for intimidating the opposition. 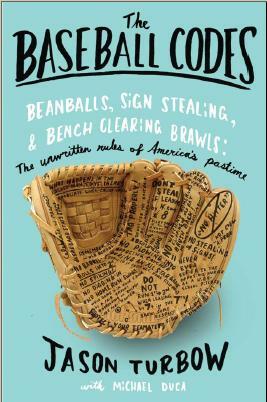 He merited a passage in The Baseball Codes, which didn’t make the final edit. In honor of Mr. Duren, here it is, straight from the cutting-room floor. New York Yankees reliever Ryne Duren, a three-time All-Star who led the American League in saves in 1958, didn’t have to wave his arms or act intimidating on the mound—all he needed was to warm up. Duren had one of the league’s most potent fastballs, paired with one of the league’s worst senses of where his pitches were going. (He twice finished among the American League’s top 10 in hit batsmen, despite starting only one game each season.) That, combined with Duren’s poor eyesight—his eyeglass lenses might have been the thickest in major-league history—was enough to keep batters perpetually ill at ease. The right-hander knew this, and did what he could to perpetuate their discomfort. Broadcaster Tim McCarver once told a story to partner Ralph Kiner about Duren hitting a batter in the on-deck circle. Kiner said he already knew the story. So, the very definition of effectively wild, eh? Awesome.